Getty/Kevork DjansezianAmazon Fresh has gone through some changes of late. Amazon Fresh, the e-commerce giant’s grocery-delivery program, has slipped in a ranking of customer service and is getting some poor reviews online. Some customers say they have experienced issues like missing items, delayed or canceled deliveries, and damaged produce. They say they believe the service has become unreliable. The issues call into question the future of the service, according to at least one analyst. 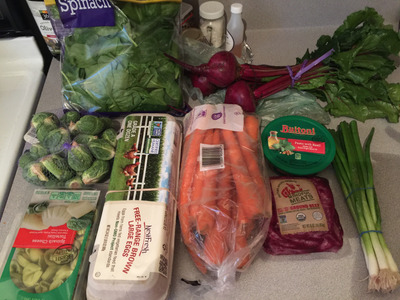 Some customers are saying that Amazon Fresh is growing rotten. The online grocery-delivery service has undergone many changes in the past year, and it’s racking up poor customer reviews as its future – and its place within the AmazonPrime ecosystem – is increasingly being questioned. The service, which is available in roughly 20 cities around the world, allows customers to place fresh grocery orders to be delivered at a predetermined time. The complaints are also visible on social media and even on Amazon’s review page for Fresh, which shows a 3.3 rating out of 5 and more than 800 reviews. Business InsiderA typical Amazon Fresh order. 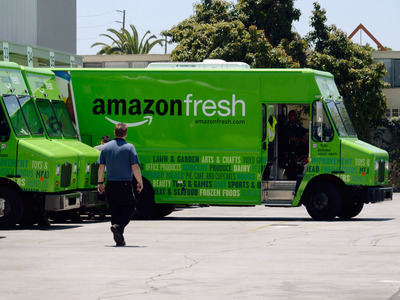 Amazon Fresh, now in its 11th year of service in its earliest markets, has fallen dramatically in at least one ranking of customer satisfaction. In the 2018 Temkin Experience Ratings, a benchmark that gathers customer experiences in several industries and assigns companies a ranking, Amazon Fresh fell 13 points from the previous year, to 67% and last place among grocers. It’s in the nebulous zone between “good” (70% and above) and “poor” (below 60%). Now some customers are saying they have noticed a steep drop in Fresh’s quality and reliability over the past year, especially in the first few months of 2018. Negative reviews are also appearing on Amazon Fresh’s page. Nearly all of the customers who spoke with Business Insider said they had switched to a competitor or changed their shopping behaviour on the platform to account for its issues. Amazon seems to have instituted a very lenient refund policy for any kind of complaint – from damaged items to missed deliveries – to keep customers happy. Customers say Amazon almost always opts to refund the order, in whole or in part, when an issue arises. Some also received credit toward their next order in addition to the refund. If a problem does occur, however, customers are often still left without usable groceries, meaning they must either run to a local grocery store or order again for delivery in a few days. Inconveniences such as these might negate the utility of Fresh as a service in some customers’ eyes. Fishel expressed a similar sentiment. “It’s incredibly frustrating that their response is always, ‘Well, here’s a few dollars back,’ when I really just wanted the groceries,” she said. An Amazon representative declined to comment on the record for this story. The most troubling issue, according to customers, is items missing from their orders. Amazon Fresh has a section on its help page that addresses out-of-stock items. “When possible, we’ll try to substitute the unavailable item with a similar product (exceptions are specialty items),” it reads. But customers say Amazon does not always notify them when an item appearing on Fresh’s website is actually out of stock. If an ordered item is out of stock when it’s fulfilled, it may just not appear when the order is delivered. That leaves customers wondering whether the item was out of stock or whether there was a mistake during fulfillment and it was forgotten. One customer said they typically had such large orders that they sometimes didn’t even realise they didn’t get an item until they reached for it in the pantry to find it isn’t there. Getty/Kevork DjansezianThe future of Amazon Fresh is being called into question. Some customers have reported entire bags of groceries going missing. Calling Amazon’s customer-support line in this context can also net a refund for the missing package, but as far as tracking down the missing groceries goes, customers say they haven’t had any luck. In this case, it is up to the customer to place a new order, rather than Amazon to redeliver the same order. Several customers said they’d had missed deliveries – either their delivery just never showed up, or it was delayed past the delivery window. Kodali called missing or out-of-stock items “one of the biggest frustrations” in online grocery shopping. But she said that since Amazon nailed online shopping years ago, it should be better equipped to handle them. Damaged items were another issue for customers, some of whom said the damage their orders sustained in transit was beyond what could be considered acceptable within the risk of ordering groceries online. Most of the damage, these customers said, seemed as if it could be blamed on poor packing on Amazon’s part, even taking into account that orders often shift in transit. Customers complained about frozen items being packed next to fresh herbs and produce, freezing or crushing them in transit and rendering them no longer usable, and cartons of milk getting crushed by heavy items, like 12 packs of canned seltzers, packed on top of them. 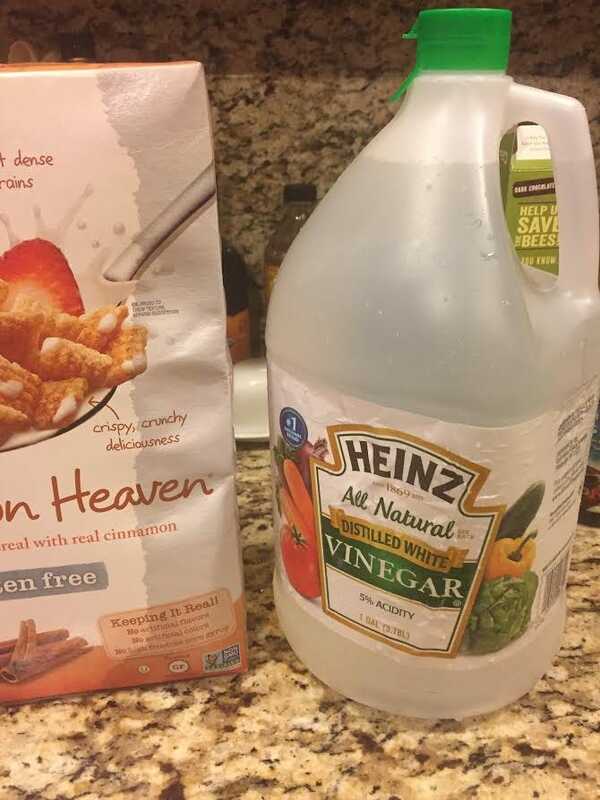 Gillian FritzscheA vinegar bottle leaked, causing damage to a cereal box. Brian McCullough/Techmeme Ride Home podcastA customer shows off sour cream that had been damaged in delivery. 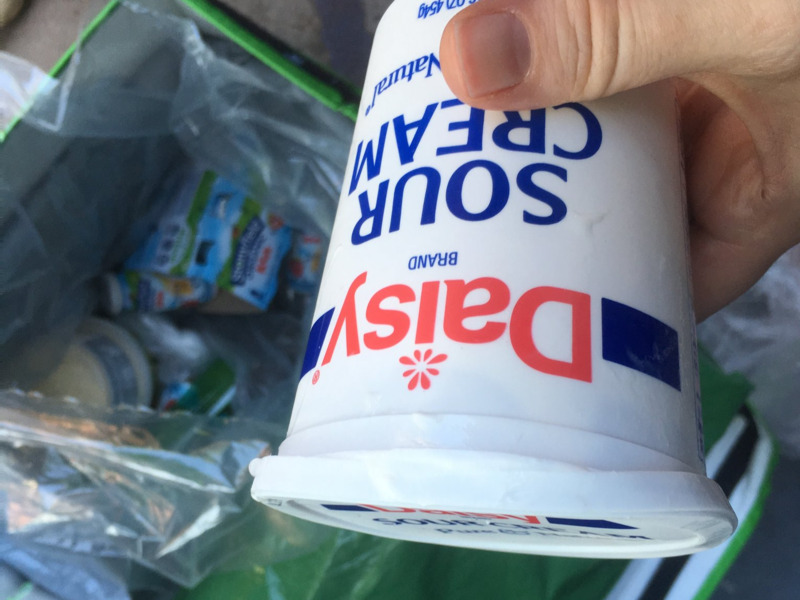 Brian McCullough/Techmeme Ride Home podcastMilk seeps from a delivered Amazon Fresh order. Jennifer Silva, another customer from Los Angeles, said she once ordered food as well as a cleaning product with bleach in one order. The items were all packed in one bag, with the cleaning product on top. In transit, it ended up leaking all over the food, rendering it all unsafe for consumption. Amazon has a policy of adding a plastic bag for products like cleaners and detergents to separate them from food items. But as a rule, it separates items in different bags by temperature. When Fishel called to complain about the way her items were being packed, an Amazon customer-service representative suggested she change her ordering behaviour, Fishel said. Instead of including an entire grocery order all at once, the representative suggested, she could order fragile items in one batch and heavy items in another. Receiving damaged goods once in a while can be the cost of delivery, according to Kodali. 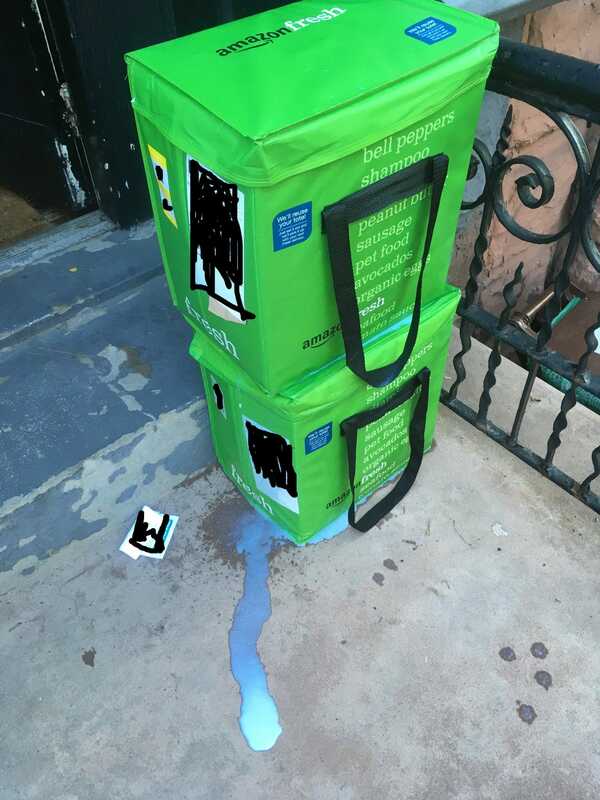 Kodali speculated that since there’s a “this way up” policy for food delivery packages – basically, packages shouldn’t be left on their side or upside down – the issues customers are reporting could be exacerbated by inexperienced people delivering the packages. “As long as the order is coming from their distribution center and they have packed it, these issues shouldn’t” happen, Kodali said. Amazon Fresh has evolved a lot over the past year. It introduced Whole Foods items to the platform and stopped service in some suburban areas across the US. Behind the scenes, the teams behind Fresh and Prime Now, Amazon’s two-hour delivery service, are now one. Fresh also kicked third-party vendors off the platform at the end of May. Operationally, there have been further changes. The service has recently switched from using ice packs to frozen water bottles to keep things cold. In some markets, Fresh has also switched from delivering orders in its reusable, green cold-storage totes to paper bags – even for cold and frozen items, which are first wrapped in layers of plastic. Customers also say the negative experiences with Fresh have coloured their perception of Amazon and Amazon Prime, even if they are otherwise happy with the service. “The troubles we’ve had over the last few months have loosened the grip Amazon had on me,” said Gillian Fritzsche, a customer in Brooklyn. Cost is also a consideration. An Amazon Fresh membership costs $US15 a month, and it’s available to only Amazon Prime members, who also pay $US120 a year or $US13 a month for that subscription. Kodali said that none of the issues described were “unfixable” but that the fact that Amazon has not fixed them yet may point to the possibility that it’s preparing to sunset the service in its current iteration. Fresh is a service that has struggled to find its footing, and there are indications that it hasn’t reached the profitability targets Amazon has set, she said. Fresh grocery is still a focus for Amazon, though its approach to grocery has changed massively since Amazon Fresh began. Whole Foods’ brand integration has been a major point for growth for both Prime Now and Fresh, leading to increased sales on the platforms. 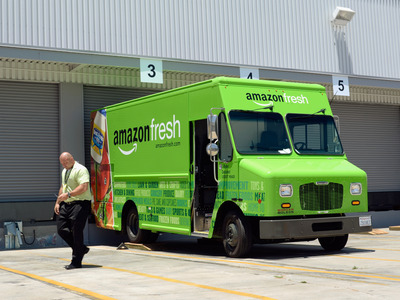 But now that Amazon is working on integrating Whole Foods with Prime Now in US cities, delivering from stores instead of dedicated fulfillment centres, Fresh may soon find itself obsolete in Amazon’s new grocery paradigm.